38 - $133.99 Only 1 left! 40 - $133.99 Only 5 left! 42 - $133.99 Only 4 left! 44 - $133.99 Only 6 left! 46 - $133.99 Only 4 left! There is no image more glorious and patriotic than the U.S. flag. Why just the thought of that majestic red, white, and blue colors slowly rippling in the wind makes us quiver just a little bit. It makes us feel the history of this great nation and it makes us remember all of the blood, sweat and tears that our former Presidents put into this country! It makes us want to celebrate this country like our forefathers intended. Celebrate the 4th of July exactly as our forefathers would have wanted us to! Go break out all of your fireworks. Get the barbecue started. Put a game of baseball on the TV. Start baking that apple pie and for goodness’ sake, put on your Stars and Stripes Summer Opposuit. 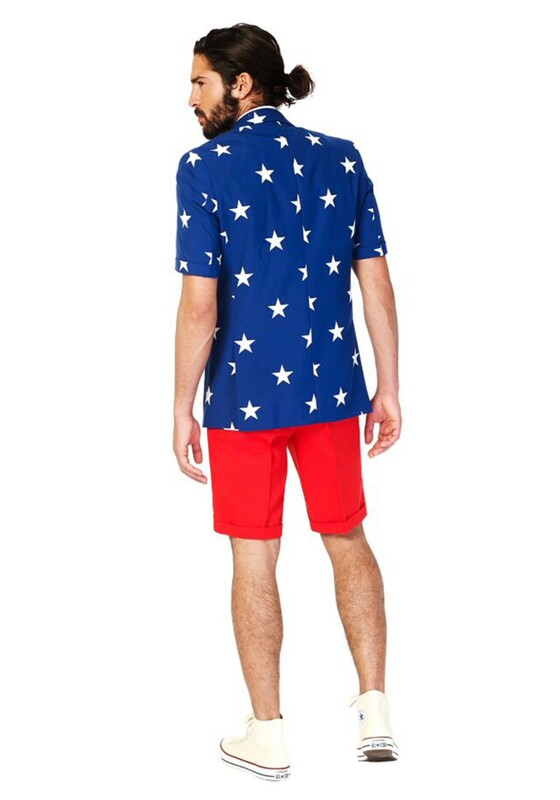 This adult Opposuit comes with flashy style based on the iconic American flag. It comes with a pair of shorts, a short-sleeved jacket and a necktie. Yes, you read that right! This wacky suit scoffs in the face of tradition by offering the jacket and pants in a summer-friendly style that will help keep you cool, while you keep cool during 4th of July weather. The blue jacket with stars on it and the shorts are bright red to create the look of the patriotic flag. The tie comes with a red and white stripes pattern to match. When you wear this men’s Starts and Stripes Summer Suit, you’ll be making your forefathers proud! You can imagine George Washington nodding in approval at the very sight of this majestic look. You can almost hear the voice of Thomas Jefferson whispering, “Awesome suit, dude.” You can almost even feel Abraham Lincoln shaking your hand. You can… well, you get the picture. 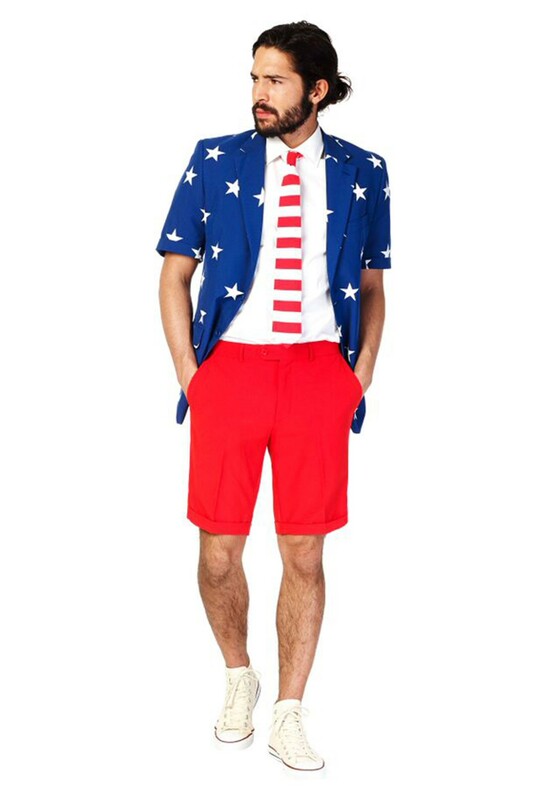 This suit is going to make you feel very patriotic!